The Grossvenediger is one of the most amazing glaciated summits in the Alps. 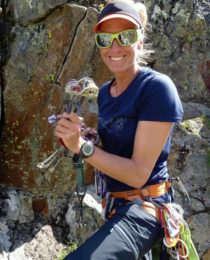 Maria, an IFMGA certified guide, will take you up to its summit! The Grossvenediger (3657 m) is one of the most impressive summits in Austria. Today, I invite you to join me in a 2-day ascent tour by the normal route. This beautiful mountain lies in the Hohe Tauern range, on the border between Tyrol and Salzburg. Also, it’s the Venediger Group’s main peak. Besides, the Grossvenediger is one of the most incredible glaciated summits in the Alps! We will meet in Neukirchen am Grossvenediger and we will head to the Kürsinger Hütte. Then, we will start planning our climb. On the second day, very early in the morning, our ascent will begin! You can check the detailed program below this text. Once in the summit, we will enjoy breathtaking views and all the beauty of the Austrian Alps! On a clear day, we will be able to even appreciate the Ortler summit. 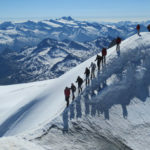 Do you find this Grossvenediger ascent tour tempting? Then contact me and we can start planning your own trip! I will be happy to answer any questions you may have about the program. You can also check other tours that I guide, like the Stubacher Sonnblick ski touring program or the Gaisstein peak guided ski tour. We will meet at Neukirchen am Grossvenediger, and we will get a taxi to the funicular station (1929m). Then, we will head to the Kürsinger Hütte (2548 m). The equipment can be sent to the hut by cable car. We will decide whether we will make the climb to the hut by the normal path, the Klamml, or whether we will climb over the new via ferrata route. It will be a 600 metres ascent (2 hours). Early in the morning we will start our tour towards the Grossvenediger summit. Still in the dark, we will go to the glacier entrance with the light of our headlights. Later, the daylight will greet us. 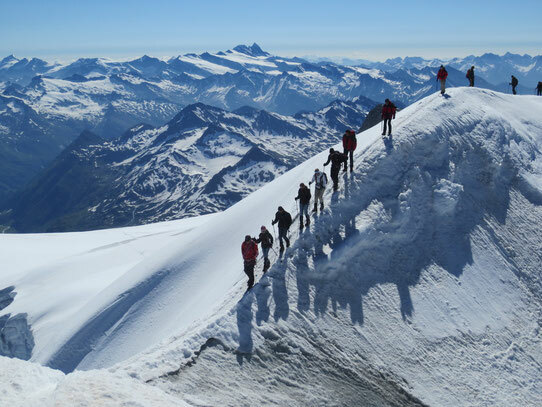 We will enjoy the ascent on the “flat” glacier and let our thoughts wander. Once we reach the Summit, we will have time to take some pictures and enjoy a spectacular panorama. Then, we will start our descent. Back on the Kürsinger Hütte we will then continue the descent to the Seilbahnhütte, where the Täler taxi will bring us back to the starting point. I can provide you with rental equipment (harness, crampons). There is also the possibility to climb the Grossvenediger through slightly more challenging climbs, either through the West Ridge (climbing up to the 2nd difficulty level) or the North Ridge (climbing up to the lower 4th difficulty level). You can contact me and I'll give you more details about these tours. I am a IFMGA certified mountain guide and a climbing lover. I grew up in a small farm in Mittersiller Sonnberg. My parents used to show us the beauty of our mountains. When I was 10 years old I went ski touring for the first time and I really loved it. The next years, I started climbing walls which really fascinated me. I also participated in many competitions. My career took me to Hohe Tauern National Park where I finished the ranger training to bring visitors to the beauties of my country. In 2013, I got my official certificate as a mountain guide and ski instructor. A dream came true! Since 2014, I have been working a full time guide, guiding in different areas such as Ortler, Valais, Dolomites, Wilder Kaiser, Muztagh Ata (China)... and of course, in some of our famous mountains such as Großvenediger and Großglockner. Feel free to get in touch with me! I'll be glad to share with you a great moment in the mountains!